This apartment for 8 is located just above the hotel Lav Meridian 300 m from the beautiful sandy beach. It has 3 bedrooms, a large living room, a fully equipped kitchen, 2 bathrooms and is fully airconditioned. On the south side of the apartment there is a balcony with view on the sea and islands and on the east side there is a big terrace with sitting chairs where you can spend your time relaxing and drinking your favorite drink and enjoying the sunsets. There's a Private parking in the back of the apartment and barbecue/grill also at your disposal. 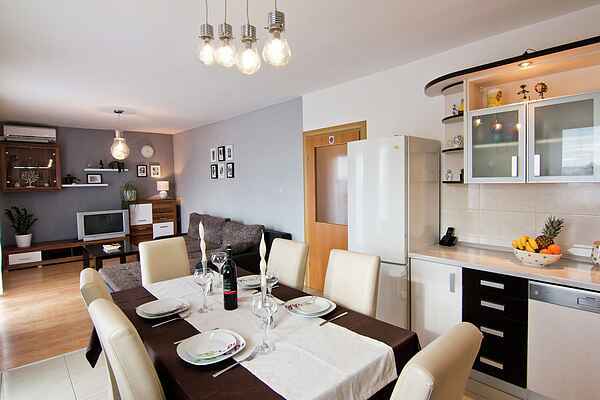 For holidays in Podstrana our apartment is the perfect place for you and your family and friends. Podstrana is a beautiful tourist town located only 8 km from Split and 25 km from the airport. It is known for its beautiful 6 km long sandy beach, crystal clear waters, beautiful panoramic view of the island of Brac, rich cultural heritage, olives, wine and friendly locals. Numerous restaurants, taverns and pizzerias offer a superb gastronomic and enological offer. Guests who want entertainment and night life, will find a place in one of the many cocktail bars on the beach.